gustia: Ariane. The French Apple with its own Ambassador. Ariane. The French Apple with its own Ambassador. As I do every spring, I start to feel a bit homesick for the "old country," which in my case is Canada, so I dug around the fruit keeper in my "frigo" for a taste of home: my secret cache of McIntosh apples or "Macs" as they are affectionately called by Canadians. I brought them back with me in December and I've been rationing them like Scrooge to make them last as long as I could. I guess I'd eaten them all and not remembered because after a few minutes of digging, I came up empty handed. I suspected hubby until his whereabouts were verified. Just by chance when I was at our local Health Food shop the next day, I was cruising the produce section when I spotted some apples called, "Ariane" that looked a lot like McIntosh. I filled a bag with a few, hoping that they tasted like a McIntosh as much as they looked like one. 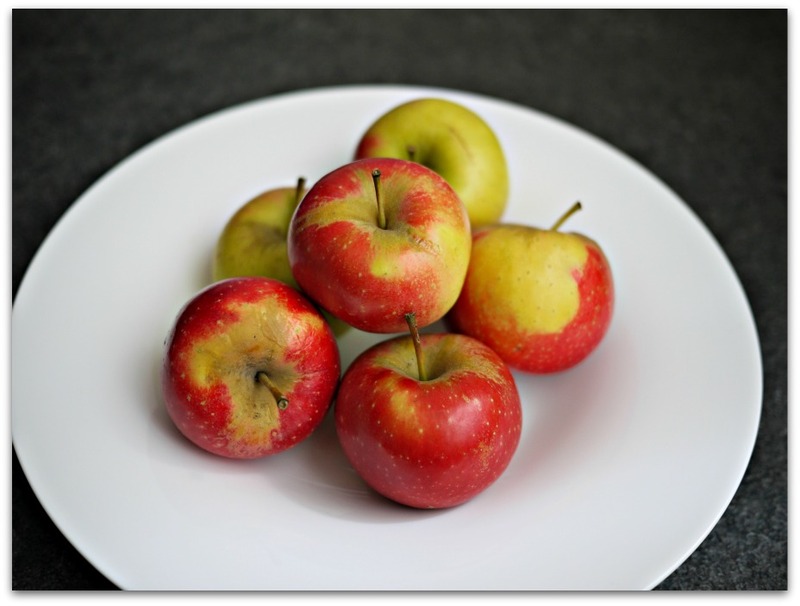 I adore McIntosh apples, especially in the fall when they're straight from the tree, all crisp and intense, acidic and sweet all at the same time. Believe it or not, I've delayed our return to Monaco in the fall just so I could enjoy the McIntosh season in Canada! Generally speaking, I find French apples too sweet and their taste for me at least, is a bit monotone. 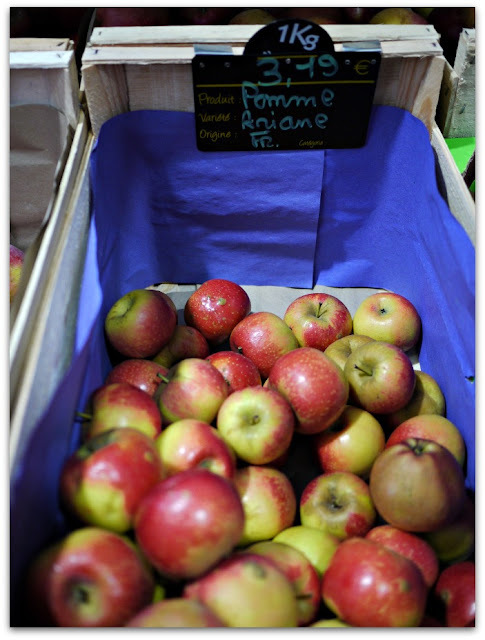 When I do buy apples in France, more often than not, I reach for the Granny Smiths. 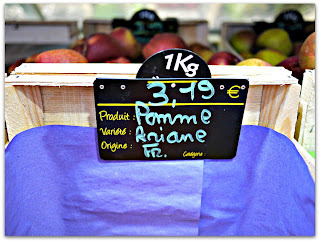 What a pleasant surprise when I tasted the Arianes and discovered that indeed, they are remarkably like a Mac! They were a bit sweeter than a Mac but they had a good balance of sweet to sour, crisp and delicious. After devouring a few, they were small after all, I did a bit of research to learn more about them. The Ariane apple was developed by French Company, Pomalia and was launched commercially in 2003. It's claim to fame, besides it's excellent flavour, is that it's scab resistant and so can be grown more or less organically. The Ariane is currently grown by 250 producers around France, primarily in the Loire Valley (in the west), the Monts du Lyonnais (to the east of central France), the Périgord and Tarn & Garonne (in the south-west), and Provence (in south- east). In 2011, 20,000 tons of Arianes were grown. The Ariane had its moment of glory this February when it was showcased at the annual Fruit Logistica tradeshow in Berlin where 2,400 fruit and vegetable producers from around the world gather to showcase their goodies. The mind boggles. I plan to go next year. It seems I'm not alone in my appreciation for the Ariane apple. Alain Baraton, Head Gardener of the Château de Versailles is Ariane's official ambassador. You've got to love an apple with its own ambassador. Well, with this sort of taste and pedigree, I think I've found a worthy replacement for the McIntosh. At least until the fall. Only in France would you have an apple with an ambassador. And thank you for this as I have never, ever bought a really good apple in France. True, having spent part of my childhood in Michigan, my standards are high . I will look for these at tomorrow's market. You know what's funny about those apples? I went back the next day to where I bought them to gather some intelligence (and buy more) and I took a closer look at the shipping box. The tag on the box read, "Producteur SCA MAS Daussan,Stéphane Charmasson, 13200 Arles." YOUR neck of the woods. We'll need to plan a free trade agreement. Apples for lemons. Bah, QUOI?! I bet I know who the apple guy is because last Saturday I looked for the Arianes and there is one stand that is only apples and I am sorry to admit it but it was just tooooo crazy! It was worse than the olive stand! I couldn't even wedge myself in there to see--especially with Ben. Yes! Push, shove, and spear people with your elbows to get some! I'm making a tarte tatin with some this weekend. Let me know what you think of them! I'm a Canadian expat, vegetarian, food traveller and blogger but I live in Monaco. Why? Great food and no snow. All photos and content copyright Jennifer Barnaby and Gustia. Picture Window theme. Powered by Blogger.